The FCA Drive for Design contest was first launched in 2013. At that time, only Detroit-area students were able to enter. Now, open on a national level, more than 25 students have won the contest. This week, we catch up with two past winners, Alex Fischer and Josh Blundo. In 2014, students were asked to design a vehicle that satisfied the needs of young consumers while remaining eco-friendly. Alex Fischer submitted the winning sketch. The contest gave Alex the confidence he needed to pursue a career in automotive design. In 2017, Alex joined FCA as a design intern in the Dodge//SRT design studio and has since graduated from the College for Creative Studies (CCS). The following year, in 2015, students were asked to submit a sketch of their vision of the Dodge brand. Josh Blundo took the top prize that year. Josh also joined FCA as a design intern in the Dodge//SRT design studio and is studying at CCS today. The main goal of the Drive for Design contest is to increase awareness and educate students and parents about the good-paying opportunities available in this field. Many of today’s designers had no idea that automotive design could be a career option and the FCA design team wants to change that. Think you have what it takes to be a car designer? You have one week left to submit your sketch! The FCA Product Design Team is challenging high school students grades 10-12 to sketch the ultimate status vehicle using any FCA brand. Ram showed its 2019 Ram 3500 Tradesman at the NTEA Work Truck Show to the public in Indianapolis today. The base truck is a rear wheel drive two-door (regular cab), with a long bed. It can be optioned up to a Cummins diesel with 400 horsepower and 1000 pound-feet of torque; with the 4:10 gearset and gooseneck, it can tow up to 35,100 pound. With the Hemi (410 horsepower, 429 pound-feet), the payload is rated at 7,680 pounds. Both figures are the highest in the segment, though you can’t get them both in one truck. Tradesman buyers still get a manual transfer case; vinyl floors and crank windows in the two-door keep the Ram anchored to work trucks of the past. The 2019 Rams are the only heavy-duty trucks with standard or optional safety features including adaptive cruise control, forward collision warning, and automatic emergency braking (with trailer brakes where applicable). Black accents help with job-site durability; customers can opt for chrome, as well. 17-inch steel wheels are standard on Tradesman, and 18-inch chrome-clads are optional. Inside, the heavy-duty cloth or vinyl is done in black and light gray. The vocational-use Ram Heavy Duty Tradesman has unique Construction Yellow gauge needles, a new 3.5-inch greyscale screen in the gauge cluster, plated-finished door handles, and durable textured paint. The truck was unveiled last week, but this is the first time the public has seen it. Back in 2014, Chrysler added an extended warranty to early 3.6 liter V6 engines. The otherwise highly reliable engine could have a flaw in the left-hand cylinder head, which made itself known only under an odd set of circumstances (that was relatively common in Wranglers). Knowing that, Chrysler covered it for parts and labor for a good long time — 150,000 miles or ten years, whichever came first. The extended warranty covered the 2011, 2012, and early-2013 Grand Cherokee, Wrangler, Durango, minivans, 200, Avenger, Journey, Challenger, Charger, and 300 with engine sales code ERB, if a trouble code of P0300, P0302, P0304, or P0306 was set (for a misfire in cylinder 2, 4, 6, or a combination of cylinders). Some customers were confused by the service bulletin itself, when they saw it, since it refers to the cars by body code. The Caravan listing has (RT) next to it, suggesting that only the RT (R/T) trim level was covered. In this case, though, RT is a body code, not a model; the Caravan SE is an RT-body. Confusing, yes, but, really, only for that generation of Caravans. Oh, and the LX cars (for 2011-13, that’s just the 300), since Chrysler used to have LX as a model (along with LXi). Fortunately, Chrysler never used JC, JK, JS, LC, LD, WD, or WK as trim levels. U.S. dealers should have details as part of warranty bulletin D-14-12, dated June 10, 2014. Other warranty bulletins were SAB-2014-11 (Canada), BG-22-14 (Mexico), ID-14-04 (Puerto Rico and the Virgin Islands), and ID-14-03 (everywhere else). Chrysler’s Pentastar V6 engines were critically acclaimed for their power, economy, and quiet operation; they have generally been trouble-free after the head issues were resolved. Over the years, a growing list of diverse FCA US leaders are recognized for their technical achievements, management skills, leadership and community service. Perhaps the timeliest of these awards are those earned as part of the annual Black Engineer of the Year event held each year in February during the nation’s observance of Black History Month. And while the event is a great opportunity to celebrate the current accomplishments of several very talented employees, it is perhaps a better opportunity to step back and consider all the FCA US employees of African American ancestry who have earned this important recognition each year for many years. 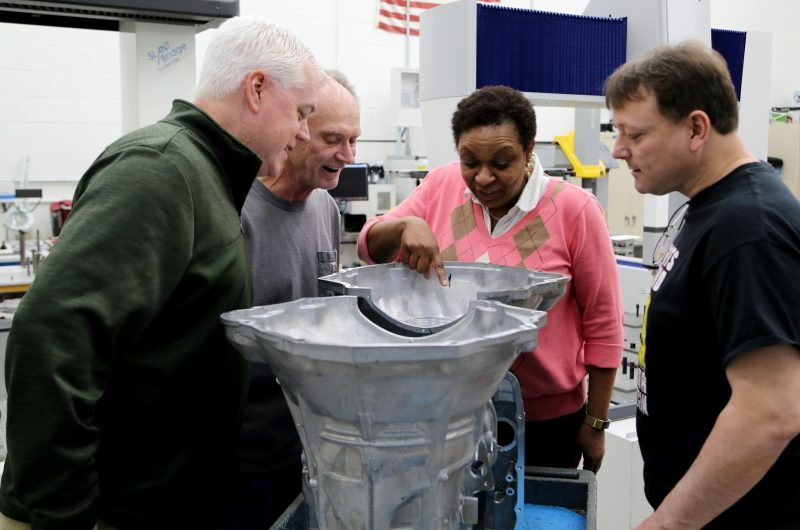 This year, U.S. Black Engineer & Information Technology magazine awarded its 2019 Black Engineer of the Year Gerald Johnson Legacy Award (BEYA) to Tanya Foutch, Quality Engineering Supervisor, FCA US LLC. Tanya was named Resident Engineering Supervisor at FCA US transmission plants in Kokomo and Tipton, Indiana, in 2016. In this role, she leads a team focused on identifying quality issues for the Company’s current and future portfolio of products. Tanya graduated from the Illinois Institute of Technology in 1995 with a bachelor’s degree in mechanical engineering. She earned a master’s degree in business administration in 2000 from Anderson University in Indiana. She is an enthusiastic advocate of STEM education for youth in her community and actively engages with and mentors young women interested in pursuing careers in science, technology, engineering and math. Since 2017, Tanya has been the energy and passion behind a successful annual STEM (science, technology, engineering and math) summer camp for youth in the Kokomo area. Last year, Eric Burnett, Automatic Transmission Chief Engineer, FCA US LLC, earned BEYA’s Edward Welburn Legacy Award. And before Eric, Kristal Fears, Manager – Central Stamping Assembly, FCA US LLC, earned a special recognition award at BEYA. The achievements of these colleagues, and so many others through the years, deserve our attention and respect as we continue our observance of Black History Month. Ram Truck unveiled today the 2019 Ram 1500 Classic Warlock. The Warlock pays homage to the original Warlock pickups of the 1970s and offers buyers a well-equipped, factory-customized truck with unique style, capability and value. The 2019 Ram 1500 Classic Warlock features a black grille with bold R-A-M lettering, 20-inch semi-gloss black aluminum wheels, front and rear powder coated bumpers, 1-in. factory lift, black wheel flares, LED fog lamps, projector headlamps with dark bezels, LED rear tail lamps, black badging, tow hooks, unique hood decals, heavy duty rear shocks and an optional Sport hood. Warlock decals on the bedsides round out the package. Standard on the Warlock package is Diesel Grey cloth seating, ParkSense rear park assist and Ram 1500 Classic’s Luxury Group that includes a leather-wrapped steering wheel, auto-dimming rearview mirror, overhead console, 7-inch cluster display, LED bed lighting and power foldaway mirrors. 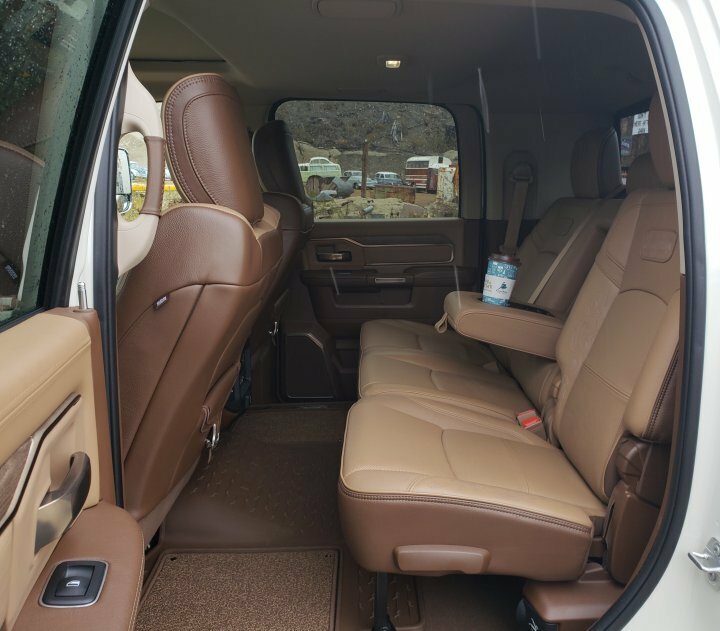 Customers can also add heated bench or bucket seats, an 8.4-inch Uconnect touchscreen with navigation, black side steps and a spray-in bedliner. The Warlock is available with either with the award-winning 3.6-liter Pentastar V-6 (305 horsepower /269 lb.-ft. of torque) or the legendary 5.7-liter HEMI® V-8 engine (395 horsepower/410 lb.-ft. of torque) — both mated to the TorqueFlite eight-speed automatic transmission — 4×2 or 4×4, Quad Cab or Crew Cab (5-ft. 7-in. bed only) configurations. The 2019 Ram 1500 Classic Warlock will be produced at the Warren Truck Assembly Plant (Warren, Michigan), which has built more than 12.5 million trucks since it started operations in 1938. What It Is: The 2020 Ram Power Wagon, caught completely uncovered in metro Detroit. Even before the recently refreshed 2019 Ram 1500 was released into the wild, camouflaged test mules of the Ram HD 2500 and 3500 trucks were common sight in Michigan, so we knew it would only be a matter of time until we snagged a photo of a Ram HD wearing nothing but the paint it was born in. In this case, it’s a Power Wagon, Ram’s reptilian off-road beast based on the Ram 2500. Why It Matters: The new-for-2019 Ram 1500 has impressed many with its class-leading ride and well-executed interior, to the point of attracting the attention of die-hard Ford and Chevy fans. If Ram’s HD trucks can pull off the same trick, it could mean some big returns in the cash office, because heavy-duty pickups are a high-margin product. Platform: While we don’t expect it to deviate dramatically from the current robust body-on-frame construction, the 2500-based Power Wagon captured here appears to be taller and larger overall, taking many of its styling cues from the 2019 Ram 1500 series. As an indicator of its overall size, note how small the wheel-and-tire combination looks in those giant wheel openings. Expect Power Wagon standbys to return, including front anti-roll-bar disconnect, locking differentials, and an integrated winch. It will be interesting to see whether Ram outfits the new HD series with the same active vibration-quelling technology used in the new 2019 Ram 1500. The grille looks similar to those on previous models, but the hood shape is new, and the bumper appears to be an all-new design that “kicks up” on the ends below the headlamp housings. The rearview mirrors are also similar, but the plastic wheel arches feature a slightly new design with a notch at the top. The taillamps are of a new design, but for obvious reasons the tailgate doesn’t display the Power Wagon nomenclature; the integral front winch, however, is traditional Power Wagon kit. Powertrain: We don’t expect much in the way of powertrain changes. The 410-hp 6.4-liter Hemi V-8 and six-speed manual transmission are likely to return, although we wouldn’t be floored if Ram upped the gear count for improved fuel economy. As long as we have our wish list out, the return of the venerated Cummins turbo-diesel as an available engine in the Power Wagon would be a welcome addition to the lineup. Competition: Chevrolet Silverado 2500HD, Ford F-250 Super Duty, GMC Sierra 2500HD, Nissan Titan XD, Stegosaurus. Estimated Arrival and Price: Price is still undecided, but without revolutionary technology or powertrain updates the Power Wagon will need to stay near the current model’s $54,540 base MSRP. Expect the 2020 Ram HD and Power Wagon to break cover at the 2019 Detroit auto show. Currently assembled in Ram’s Saltillo, Mexico, facility, Ram HD assembly is slated to be moved to its Warren, Michigan, plant in or around 2020, where it will be produced alongside the 1500. Whether or not Ram will wait until the move is completed to put the next-gen HD trucks on sale is yet to be seen. Either way, tradition dictates that it hit showrooms by the third quarter of 2019. FCA US has landed Motor Trend’s 2019 SUV, Truck and Person of the Year awards. The editors of the automotive publication have named the Jeep® Wrangler as the 2019 SUV of the Year® and the Ram 1500 the 2019 Truck of the Year® — two of the most coveted automotive industry awards in extremely competitive segments. Former FCA CEO Sergio Marchionne is honored posthumously with Motor Trend’s 2019 Person of the Year. Motor Trend’s “Of the Year” awards recognize the best vehicles representing exceptional value, superiority in their classes and impact on the automotive scene. “The Jeep Wrangler and Ram 1500 are significant products at FCA; concurrently winning Motor Trend’s SUV of the Year and Truck of the Year titles is a proud accomplishment, and a testament to the capability and determination of our employees,” said Mike Manley, Chief Executive Officer, Fiat Chrysler Automobiles. “These awards help to acknowledge our team’s tireless efforts to ensure the new Wrangler and the new Ram 1500 stand out in their competitive segments. Motor Trend’s “Of the Year” program is open to any all-new or substantially upgraded 2019 model-year vehicles. Instead of being compared against one another, contending vehicles are first put through Motor Trend’s full battery of performance tests to evaluate virtually every aspect of each vehicle. All competitors are then evaluated on three separate courses at a professional automotive test center before finalists are selected. “For 2019, the Ram 1500 and Jeep Wrangler blew away our Motor Trend editors and judges by not only delivering class-leading capability for work and play, but truly impressive levels of refinement, technology, style and comfort,” said Ed Loh, Motor Trend editor-in-chief. “Congratulations to FCA for delivering two real winners. After weeks of testing conclude, the judges determine which vehicles will be given “Of the Year” titles. The winners are not chosen from a direct comparison against other finalists, but instead a result of how each contender measured against the award’s six criteria: design advancement, engineering excellence, efficiency, safety, value and performance of intended function. A full report on Motor Trend’s comprehensive testing will be featured on MotorTrend.com and in the January 2019 issue of Motor Trend. Every year, Motor Trend also honors automotive leaders who deserve attention for setting rules or for breaking them, and who contribute to expansion of industry thinking. Former FCA CEO Sergio Marchionne has been named as Motor Trend’s 2019 Person of the Year, marking the third time he has been recognized for his leadership, contributions, and passion for the automotive industry and its people. Jeep Wrangler continues to deliver class-leading capability, and has been completely refined to offer consumers a vehicle truly built for work, play and for driving every day … on the road, on the trail and in any weather condition. The all-new Jeep Wrangler is loaded with advanced technology and connectivity, and boasts a remarkably comfortable interior, improved on-road driving dynamics, unique and authentic styling, new levels of safety and security features, and powertrain options that include the dependable 3.6-liter V-6 engine and an all-new 2.0-liter turbocharged inline four-cylinder engine that provides even more performance and fuel efficiency. Jeep Wrangler remains the most capable and recognized vehicle in the world. The all-new 2019 Ram 1500 is a no-compromise truck, leading in luxury, efficiency, capability and innovation. Ram leads the full-size truck segment with significant gains in fuel efficiency through an all-new eTorque mild hybrid system in both V-6 and V-8 configurations. Overall weight for the Ram 1500 has been reduced by 225 pounds. The frame uses advanced materials and engineering to eliminate 100 pounds while increasing stiffness and durability for 12,750 pounds of towing capability and 2,300 pounds of payload. The new Uconnect 4C with a massive 12-inch touchscreen leads the pickup world with technology, featuring split-screen capability, 360-degree camera views and exclusive content from SiriusXM with 360L. Active safety and security systems join the technology onslaught with adaptive cruise control, automatic emergency braking and Blind-spot Monitoring. The gas station ritual has changed over the years. Today we tend to fill the tank, clear trash out of the door pockets and under the seats, and get going. One important task has fallen by the wayside – checking the engine oil level. Oil is the lifeblood of your engine and too little or too much of it can cause serious and expensive damage. Also, regular checking lets you see if the level is falling unexpectedly, an early sign that service is needed. Checking engine oil is easy and can be done while filling the gasoline tank. You’ll even earn respect from other drivers who see you pop the hood and work the dipstick with authority. We find it handy to keep a roll of shop towels or paper towels in the car. Not every fuel station puts them out anymore. A shop rag works too. Or, in a pinch, a couple of leftover fast food napkins. Let the engine sit for a couple of minutes before you check the oil, so go ahead and start the fuel pump and clean out the door pockets. Then pop the hood – the release is usually located on the left edge of the driver’s footwell. Then slide your hand under the front edge of the hood and release the secondary latch to open the hood all the way, using the prop rod to hold it open if your car has one. The handle for the dip stick is usually topped in yellow plastic and labeled Engine Oil. If you’re not sure, check the owner’s manual for a diagram of its location. Pull the dipstick out of the tube, grasping the end of the stick with the towel and wiping it clean. Look at the end of the stick and see the high and low marks that define the safe zone for the oil level. If it’s inside the safe zone, between the marks, all is good so put the dipstick fully back into the tube, close the hood and wipe your hands clean. If the oil level is at or below the bottom mark of the safe zone, it’s time to add a quart of oil. Check the oil fill cap or the owner’s manual for the correct grade, such as 5W-20, and use that oil. If the oil level is above the top mark of the safe zone you should take your vehicle in for service as soon as possible. Many of today’s vehicles also have an oil life monitor that lets you know when it’s time to change the oil. When you get the signal, have the oil changed – old, dirty oil can lead to engine damage. It’s easy and quick to check your engine oil. You’ll drive with confidence knowing your engine is maintained to perform as designed. Just as home base is baseball’s ultimate winning destination, the unique Home button on the 2019 Ram 1500’s Uconnect touchscreen is the opening play to a road map full of helpful digital destinations. Weather forecasts, directions, favorite tunes, driving comfort – the Uconnect Home button lets you program all your favorite apps for quick and easy access when you need them. What makes the Home button unique is a ‘double play option offering the chance to view two different apps simultaneously on the 12-inch display with new split-screen capability. Brad Gieske, FCA Experience design manager, takes the Uconnect Home button for a spin to show how easily and quickly you can hit a home run with every trip you take in your all-new Ram 1500. Next week, Gieske puts Apple CarPlay and Android Auto, two newly integrated Uconnect systems, through their paces. Don’t miss it!